When you need to protect your child on the field, come to soccerloco; we’ve got the youth soccer shin guards you need to keep them safe during game time. At soccerloco, you’ll find the kids soccer shin guards you’re looking for at the best prices on the web because we’re the premier online destination for anyone who wants high quality soccer equipment, apparel, cleats and more at a bargain. We’ve got shin guards for kids that feature ankle protection to keep them safe when things get hectic on the field. 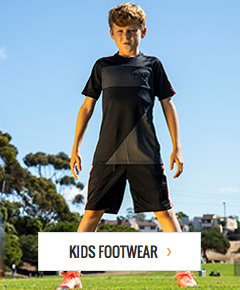 Shop now for kids’ shin guards from big names like Nike at soccerloco. Hard shells, soft linings, and snug straps make the youth soccer shin guards at soccerloco ideal for protecting your child’s legs on the field. The shells on our kids shin guards are made of tough materials like polypropylene to deflect impacts to the legs and prevent injury. We have kids soccer shin guards with soft EVA foam backings to help soften blows and make the guards feel comfortable against your child’s legs. Our shin guards for kids feature ankle protection to shield them from stray steps and kicks that can be quite painful. Stretchy straps with hook-and-loop fasteners keep the guards snug, so they don’t slip and slide during game time. All the shin guards in our store offer high levels of protection at low cost. soccerloco works hard to be your leading retailer of kids soccer shin guards and other protective equipment or gear because we love the game as much as you do. We have shin guards for kids at the best prices anywhere on the web and with flat-rate shipping, those prices will stay low. If you’re not completely satisfied with your order of youth soccer shin guards, no worries. soccerloco makes returns easy so you can send them back with no hassle. So when you need quality kids shin guards at great prices, come to soccerloco, your premier destination for all things soccer. Shop with us today to score all the protective gear you need to keep your child safe and injury-free.